Ivy and Olivia can’t lose each other again! Even though the twins were separated at birth and have only been friends for a few months, they can’t imagine life without each other. But now Ivy’s dad has decided to move to Europe – and he’s taking Ivy with him! Oh no! With Olivia’s cheerleader optimism and Ivy’s vampire craftiness, they’re determined to come up with a plan that will keep Ivy and her dad in Franklin Grove. But can two teenagers stop a fully-fledged vampire from spreading his wings? 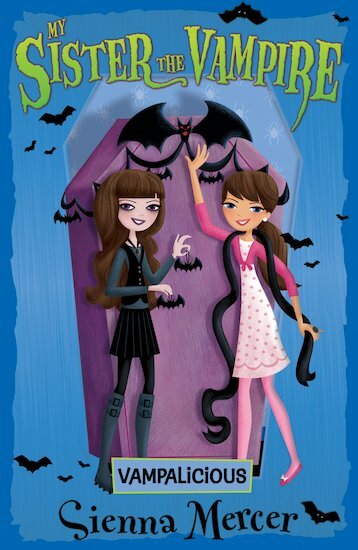 Sink your teeth into Olivia and Ivy’s fourth fright-time adventure! this is surely vampalicious, i love this bookso much i can read this over and over again without being bored. They’re great at trying to convince. I still haven’t finished the book. Though, it’s great ! I love this book because it’s fun and creative. i really love all the book of my sister the vampire its awsome i’m only nine but i really love it !!!!!!!!!!!!!!!!!!! The fourth book in the series brilliant !!!!!!!!!!!!!!!!!!!!!!!!!!!!!!!!!!!!!!!!!!!!!!!!!!! !